A very dedicated group have been working away for several years - to save the old Kopu Bridge. While it was not a universal choice for Thamesites, you have to give it to the group for getting on with the process. They are now at the stage where they will be beginning the repair and restoration work necessary to make the bridge safe and open! Volunteers needed. 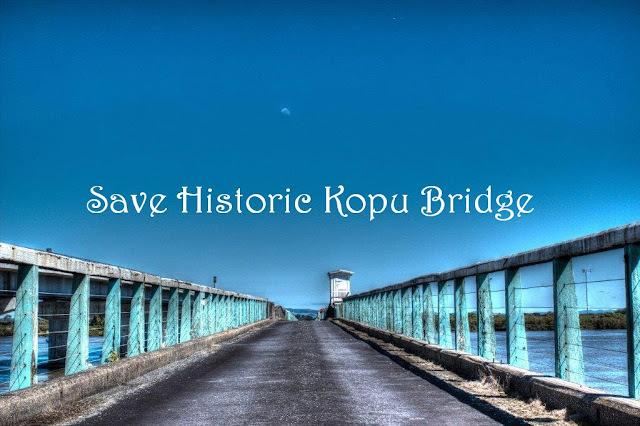 On the Facebook page for "Save the Kopu Bridge' - there is news of a special walk to be held during Heritage weekend. Register your interest, for the event labelled 'Pre-dinner Prominade on Historic Kopu Bridge' Saturday 16 March 2019 5pm to 7pm. Want to be involved with the restoration of the Bridge? Contact the Historic Kopu Bridge Society.